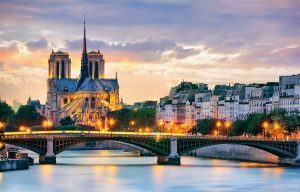 You would like to discover Paris in an alternative way without queuing up to get to touristic attraction everyone has already seen? Or do you just want to do uncommon things other than touristic activities? 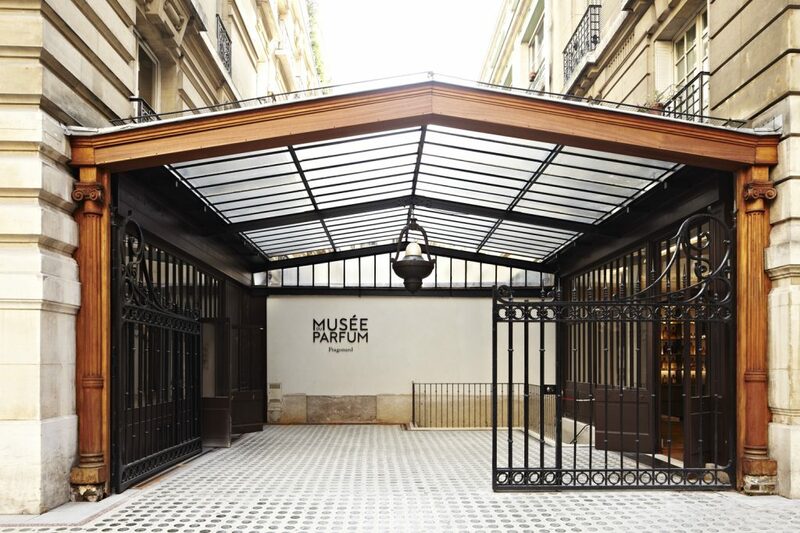 The louvre Museum and the Georges Pompidou Center are not the only Museums in Paris. There are many others, which make Paris worth visiting. 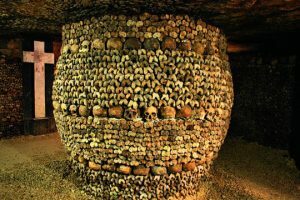 The Catacombs are a maze-like ossuary, 20 meters under the Paris Road’s. Beforehand, only insiders were visiting this” spooky place”.Now, it is so successful that even families with small children are queuing up to get to the Catacombs. In the XVIII century, more than 6 million mortal remains were evacuated there, to make place for new death people. If you plan to visit the Catacombs, I recommend you packing warm clothing because it’s cold, there. 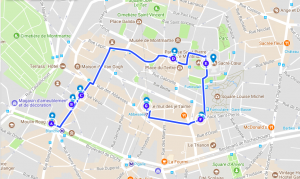 I also recommend you schedule something after that, because a visit to the Catacombs takes approximatively 45 minutes,while the waiting time sometimes be very long, as only 200 people can go in at the same time. If you are planning group-visits, I suggest you reserving 8 weeks in advance. As you may certainly know, France is renowned for its Perfume industry. Paris is the Place where the creators of prestigious Perfumes are based while Grasse is the centre of the Perfume industry. 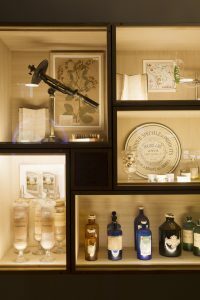 But, le Grand Musée du Parfum and le Musée du Parfum Fragonard are in Paris. 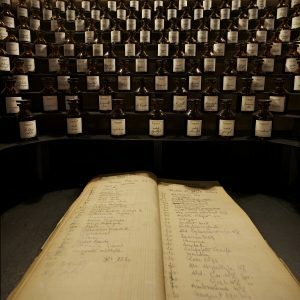 These Museums will make you understand the perfumers’ approach and offer you a real sensory experience. The entry price for le Grand Musée du Parfum is approximately 14,90€ for an adult. 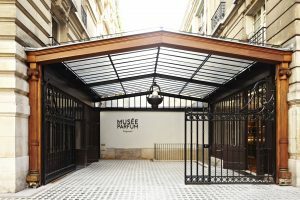 For le Musée du Parfum Fragonard, the entry is free. Chocolate is the most liked confectionery of French people. So, if you like Chocolate and French People, Choco-Story is the Museum you don’t have to miss. 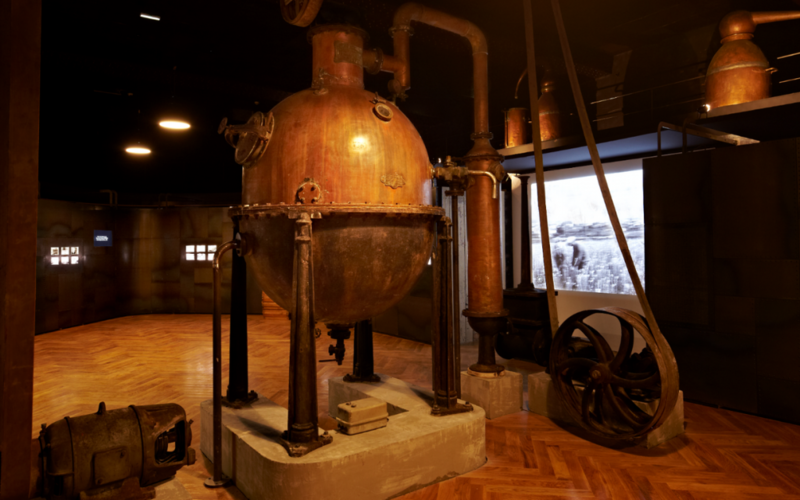 For the reason that, this museum will awake your taste buds and make you dive into the tasty world of Chocolate. On top of that, you can take home your self-made chocolate. For Christians, wine is a celestial drink which connects “God” to the Human beings. No matter what color, wine is expected on every French dinner tables. The Wine Museum, “Le musée du vin “, is with its many wine references, an inescapable place, not far from the Eiffel Tower. 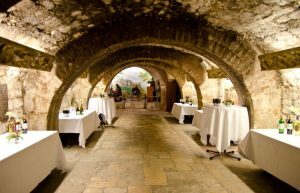 So if you are a wine lover, this is where you should go. If you are a fan of crime television shows like “Criminal Mind”, “Cold case” or “Riverdale”, this guided tour may hold your attention. Because you will visit famous places where crimes were committed. 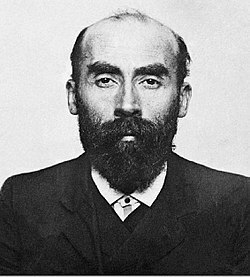 You will hear about the greatest French criminels like Henry Desirée Landru ,alias “Bluebeard”, Guy George or Thierry Paulin who once frightened French People. 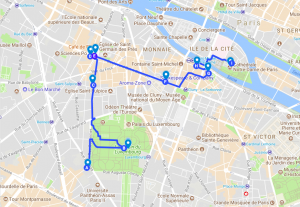 So if you want to shudder in Paris streets, I invite you to take part at this tour. Strong nerves are required for those who desire to visit the haunted mansion of Paris. In fact, it is a real emotional thrill ride and the only place in Paris where you can strain your nerves. 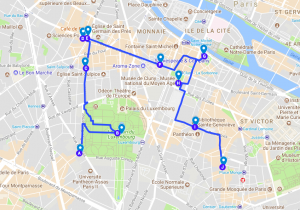 You can also get acquainted throughout different circuits, with parisian legends like “Le bossu de Notre-Dame”, “Le fantôme du jardin des Tuileries” and “Le pâtissier sanguinaire”. But, I wouldn’t recommend it if you have kids under 12. A lot of people are dreaming about renownedness and wealth, while most dreams about propriety. 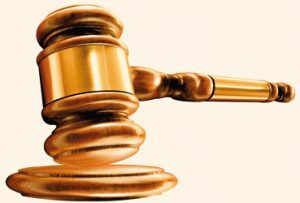 For those who dream about propriety, it is an evidence to go to auctions because, by taking part of them, you can acquire expensive things at advantageous prices. Furthermore, if you’ve never been to an auction, it would be worth looking behind the scenes of auctions. Maybe you could be the next owner. 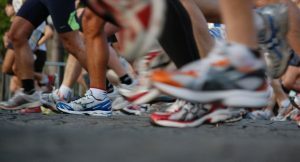 For all those who can’t keep on their feet and don’t enjoy bus tours, sight jogging may be the perfect city tour for you. 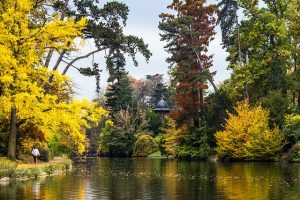 Sigh jogging is a combination of jogging and sightseeing and is currently trending on all European metropolitan areas for the main reason that sight jogging is green and healthy. 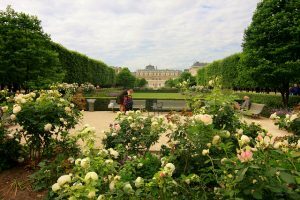 Sure, there are many other unusual things to do in Paris but this list may help you having a quick overview of things you might enjoy doing. Are you planning to visit Paris but get tired of traditional tourist activities? Then why not take a bite of great chocolate, taste French pastries or simply spend a relaxing moment in a café? I am sure that visiting Paris cafes and places to taste French delicacies can give you a completely different vision of the city. 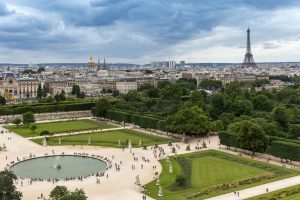 This article aims to help you to find some ideal spots for your stay in Paris. The Latin Quarter, as a microcosm of Paris, can definitely not be ignored in your trip plan. 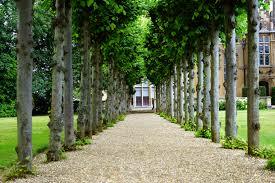 It is always comfortable to take a walk in this quarter. 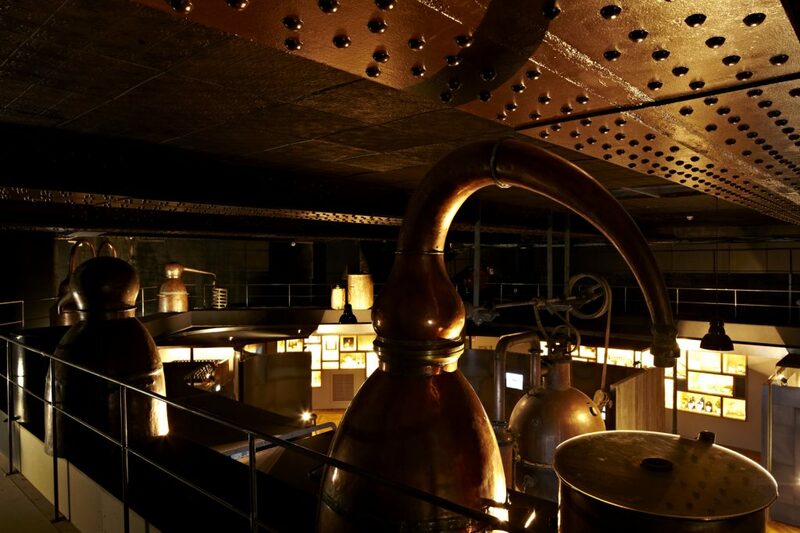 We suggest you to slow down your pace and to let the quarter tell its own history. I bet you will never regret. 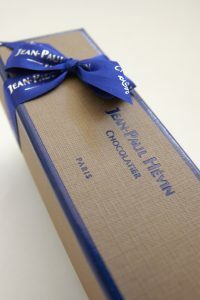 I suggest beginning this promenade by Jean-Paul Hévin, a traditional but also creative chocolate ferry. In this shop, you can find not only chocolate bars and assortments, but also some pastries such as macarons, cakes and tarts. 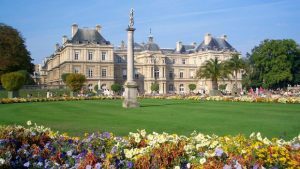 Later you can take a walk in the Luxembourg Garden, just in the surrounding. 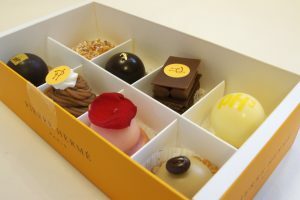 Pierre Hermé is one of the best pastry chef in the world. 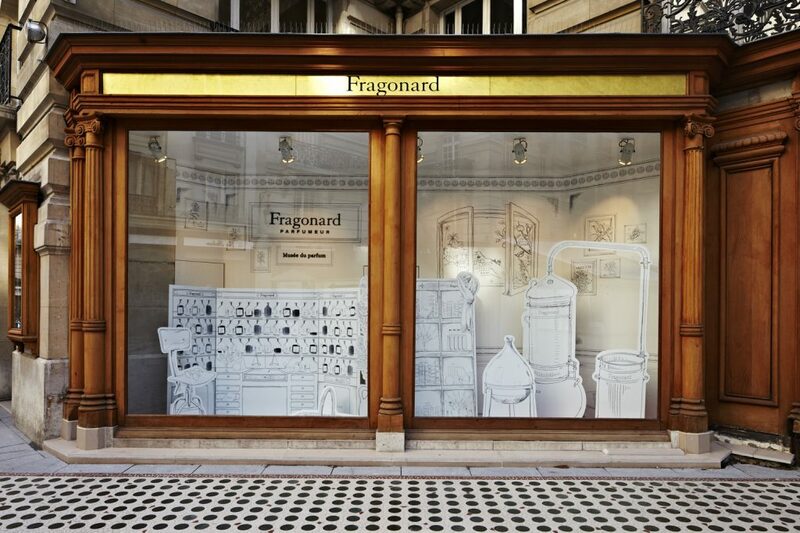 In his shop nearby the Luxembourg Garden, you must taste his delicious macarons. What’s more, his classic pastries like Ispahan, Mont-blanc, are also worth degusting. break in the terrace of a café. 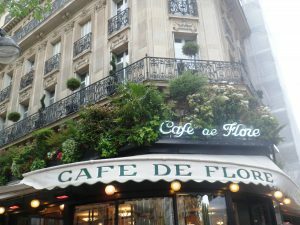 Café de Flore and Les Deux Magots are two famous Paris cafés in the quarter of Saint-Germain-des-prés. They are both celebrated for their distinguished clientele, such as Pablo Picasso, Boris Vian etc. A little break in the café gives always us energy to continue our tour in Paris. Not far from the Shakespeare & Company, you will find Patrick Roger, which is an original chocolate ferry. We can always see some beautiful outstanding creatures. After taking a look in the Shakespeare & Company, I suggest two options of ice cream for the following tour in Paris. 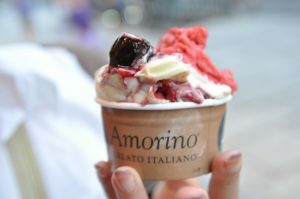 If you want to visit Notre-Dame de Paris, Amorino can be a sweet choice which helps you to kill time in the waiting line in front of the cathedral. If you are more interested by the Musée national du Moyen Âge and Panthéon, Gelati d’Alberto cannot be missed. 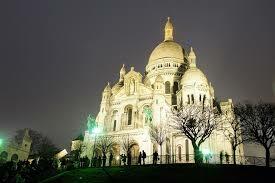 Nowadays, Montmartre is a quite artistic district. You may want to take a self-portrait by a street painter, climb and enjoy the wonderful view of Paris city here. 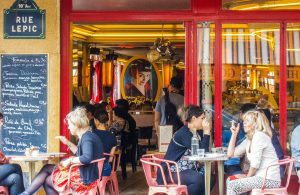 As well, I suggest cafes in Paris in Montmartre. Behind Moulin Rouge and Café des 2 Moulins, we find a shop of “A la Mère de famille”, which is one of the oldest chocolate ferries created in 1761 in Paris. 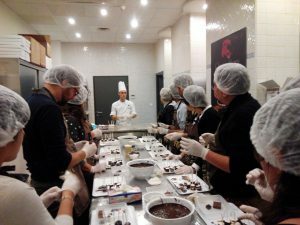 Today, this shop is kind of like a museum of French confectionery: chocolates, caramels, candies, nougats, calissons… you will definitely fall in love with this place if you have sweet touth. If you want to take some macarons as gift to your friends and family, Maxim’s de Paris is one shop to stop by in Montmartre. They have a lot of flavors of macarons, Indeed, this shop sells also cookies, “crêpe dentelle” and jams. I suggest you to pass by Christophe Roussel if you visit the Love Wall. 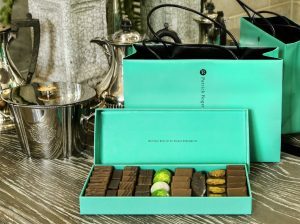 Voted as “Top 5 chocolatier in France” by Gault et Millau, Christophe Roussel makes not only chocolate bars but also some creative packages like “kisses from diamants”. Of course, their cakes of the season are also worth tasting. Bastille Day, or the French national holiday, commemorates the end of the French monarchy and the beginning of the French Revolution. After years of economic struggle and overwhelming hunger, the French commoners decided to rebel against the lavish spending of the monarchy and the growing socioeconomic divide between classes. 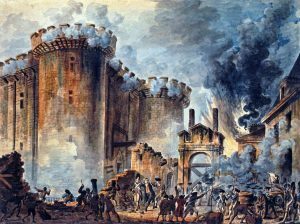 On July 14th, 1789, the fed-up bourgeoisie stormed the Bastille prison to protest the unjust rule of King Louis XVI and Queen Marie Antoinette. This successful revolt by the people of France marked the beginning of the French Revolution and the shift from absolute monarchy to republic. The capital of the French Republic, Paris offers a number of fantastic ways to celebrate the French national holiday. Large public events featuring food and dancing are offered all night long and many attractions offer extended hours and free admission. Check out our list of where to celebrate Bastille Day in Paris! On la fête nationale, the iconic Champs-Elysées becomes a patriotic symbol of French national identity. 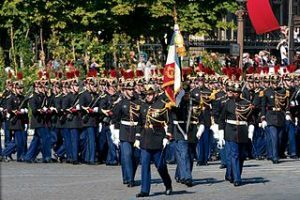 Visitors can line the streets from the Place de l’Étoile to the Place de la Concorde to see the members of the French armed forces march, fly, and ride through their capital city. The parade starts at 10:10am, but be sure to get there early for the best views! On July 14th, enjoy a free ballet performance at the Opéra de Paris. Featuring the works of choreographic legends Justin Peck and George Balanchine, this captivating matinée is a great way to start your Bastille Day celebration! The free show starts at 2:30pm, but space is limited, so get there early. 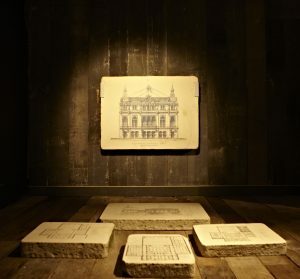 You can find more information at the official site of the Opéra de Paris. Head down to the Champ-de-Mars or Trocadéro to catch Paris’s annual fireworks display. This year’s theme Paris est une fête (“Paris is a party”) begins at 11:00pm and will feature approximately 35 minutes of dazzling pyrotechnic delights! Definitely a must see for all ages! Fitting the party theme, the fireman’s ball is an annual favorite among Parisians and visitors alike. On the nights of July 13th and 14th, head over to one of the numerous firehouses in Paris for a night of dancing in the City of Light! Beginning at 9:00pm, you can dance the night away until 4:00 in the morning each night for free, although most venues will ask for a small donation to the fire station. 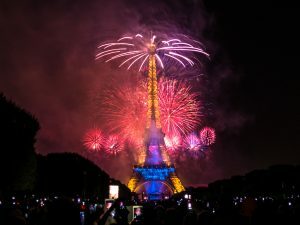 For a list of all firehouses Bastille Day celebrations in Paris, check out this article from the Paris Tourism Office.